Attorneys handling medical malpractice cases have likely heard of uterine rupture during labor but few have actually handled such a case. It is well known that a “ruptured uterus” is a potentially catastrophic event during labor and delivery but due to the small percentage that occurs, it is hard to detect when it is occurring. A ruptured uterus is more prevalent in women with a prior Cesarean section scar. A complete uterine rupture involves a total separation of the uterine wall at the site of the previous uterine scar allowing for the contents of the uterus (such as a fetus) to enter the abdominal cavity. Uterine rupture occurs in less than 1% of women who are undergoing a TOLAC (trial of labor after cesarean). However, for this 1% of laboring patients, a uterine rupture is a life-threatening event for both the mother and fetus and often ends with significant morbidity and/or mortality for the newborn infant. A uterine scar can also dehisce (break apart) as a prior cesarean section scar is stretched. This can cause a separation of the scar or thinning of the scar enough to create what is known as a “window”. A dehiscence can occur during labor and delivery, after a repeat Cesarean, or after delivery when a women has had a VBAC (vaginal birth after cesarean). Scar separation occurs in about 1% to 2% of mothers with at least one low transverse scar (side to side). The risk for dehiscence decreases after each successful VBAC. Conversely, the risk increases with the number of Cesarean sections performed prior to a TOLAC. Women at highest risk for uterine rupture and uterine dehiscence are women who have a vertical uterine scar (up and down). 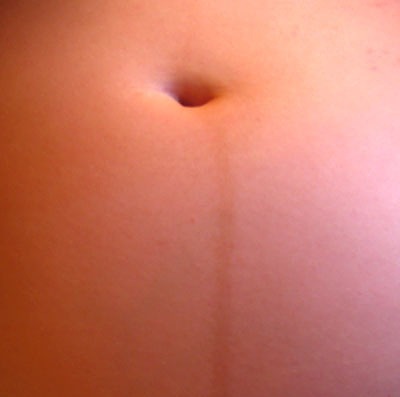 This scar may be located low in the uterus due to a previous Cesarean section for a premature breech baby or higher up on the uterus for delivery of a larger fetus. The scar higher up on the uterus is known as a “classical” scar and due to the larger surface area of potential rupture, these women are at highest risk for rupture. Therefore, it is always recommended to have women with this type of scar undergo a repeat Cesarean section. 1. Increase in uterine contraction frequency and/or strength (usually due to blood accumulation in the uterus). Uterine hyperactivity is associated with decreased time for blood to flow to the fetus between contractions, leading to hypoxia (decreased oxygen) and or anoxia (no oxygen). 2. Persistent late decelerations – Subtle, a gradual decrease of fetal heart rate after the onset of the contraction instead of with the onset of the contraction. Appears to be “shifted to the right” of the contraction. When caring for a woman undergoing a trial of labor after a previous Cesarean section, the delivery team must be hyper vigilant for any signs of maternal or fetal abnormalities and act quickly once any are identified. Protocols for VBACs should be in place in any institution of women attempting a vaginal delivery after a Cesarean section and such protocols should be followed closely. Additionally, these women should only be delivered in facilities that have the capability of performing emergent operative deliveries in the event of a uterine dehiscence and/or rupture. Linda Eckert BSN RN is a legal nurse consultant with Med League. Contact us if you need assistance in screening an obstetrical care case or want a referral to well-qualified obstetrical or other types of medical expert witness. Guise JM, Eden K, Emeis C, et al. (2010). Vaginal birth after cesarean: New insights. Evid Rep Technol Assess (191):1-397. Mercer, BM, Gilbert, S, Mark B. Landon, MB, et al. (2008) Labor Outcomes with Increasing Number of Prior Vaginal Births After Cesarean Delivery. Obstetrics & Gynecology. 111:285-291.